Buy this item and earn 2,238 ClubPoints. Utilizing expertise in Over IP KVM solutions, KE6940 series is an IP based DVI KVM Extender that allows access to a computer system from a remote USB console (USB keyboard, USB mouse, DVI monitor) anywhere over an intranet. 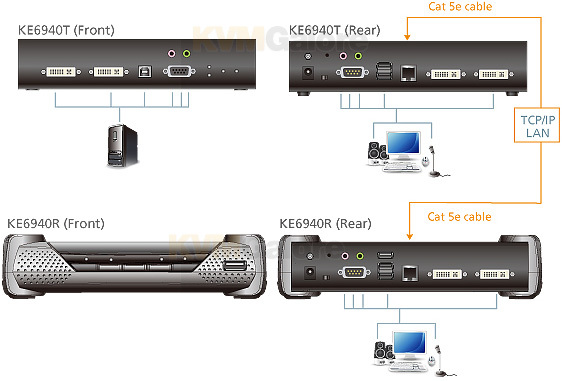 KE6940 Dual View Extender supports two DVI displays at each end, allowing the video output to display on two monitors. 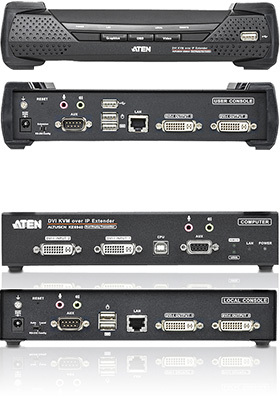 The DVI KVM Over IP Extender consists of a Transmitter unit that connects to the computer and a Receiver unit that provides console access from a separate location. The computer is accessed from the remote console over a standard TCP/IP network via Cat 5e cable that allows point-to-point, point-to-multipoint, and multipoint-to-multipoint administration. This is perfect for use in any type of installation where you need to place the console where it is convenient, but you want the computer to reside in a secure location - away from the keyboard, mouse and display in use. KE Matrix Manager® software provides advanced features for username/password authentication, autodetection of all KE6940 devices on the same subnet and define connections that can be switched and shared. New security features also provide extra protection, supporting AES-128bits encryption for secured data transmission, while RADIUS, LDAP, AD or remote user authentication provides added layer of connection security. Download KE Matrix Manager® Lite (supporting up to 16 end-points) for FREE! With an OSD, RS-232 support, and Auto MDIX, KE6940 is the most cost-effective and convenient way to get a full digital extension from anywhere on the intranet. Extend the computer's KVM console any distance over a LAN connecting the Tx and Rx units to your network. Extend computer's KVM console up to 330 feet by directly connecting the Tx and Rx units with a single CAT-5e cable. 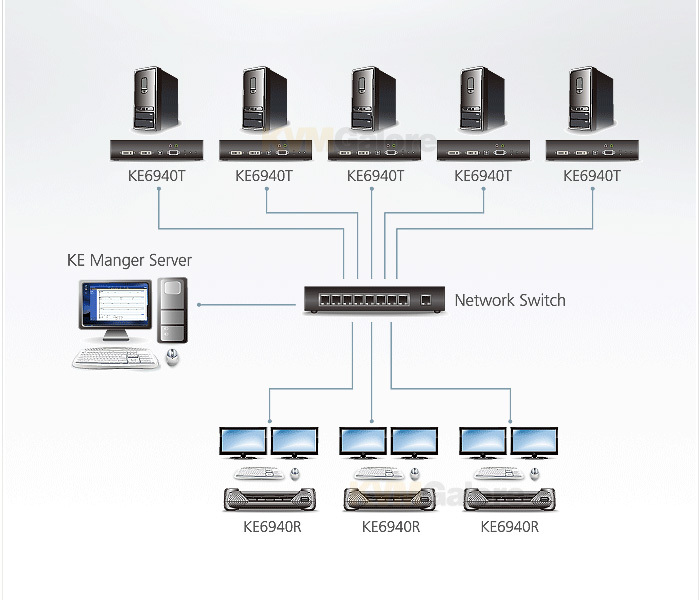 KE6940 series allows you to access, share, and switch full control of Tx connected computers from any Rx (KVM console) on the network.Flexibility allows one-to-one, one-to-many, or many-to-many computer to KVM console connections. 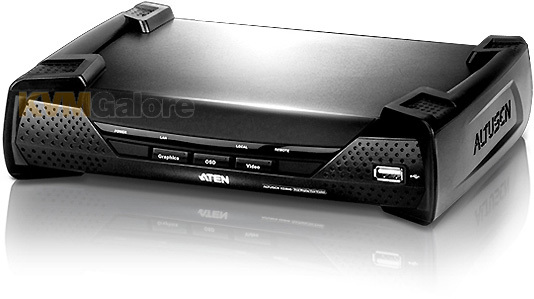 ATEN's advanced graphics processor delivers video that ensures you will experience the same vivid and sharp quality video on the remote monitor no matter how far away the console is located. KE Matrix Manager allows you to easily administer all KE6940 devices over a network, using an intuitive and user-friendly web-based GUI. Extender mode: this is the simplest setup; using a single transmitter to receiver connection that extends a computer's distance from the keyboard, mouse and monitor. One-toone setup can be directly connected by a CAT-5e cable between two units - up to 330 feet. Shared connection: This setup over a network allows a remote computer (Tx) to be shared among multiple KVM consoles (Rx). Multiple KVM consoles can access the computer at the same time and you can define the access mode when this happens. Switching connections: This setup over a network allows the KVM consoles to switch access between different computers individually and symultaneously, and allows the streaming of video, audio, USB and serial connections from different computers. Matrix mode: Delivering flexibility and performance ATEN's KVM over IP Extender provides the ability to access, switch, share and multicast computer resources among multiple KVM consoles across a network. This provides dynamic and flexible extender setup with superior video quality and smooth KVM operations without delays or lags. Listed below are additional products to consider which are compatible with KE6940Kit. These items may be required to complete your system.